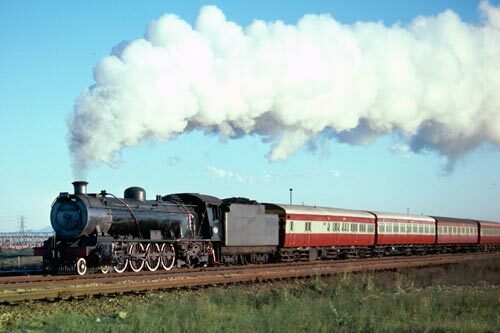 The South African Railways suburban train service linking Port Elizabeth with Uitenhage was, in 1976, the last steam hauled suburban passenger service in South Africa. Motive power had included 16CR pacifics but by the time this trip was made most trains were in the hands of very capable 15AR class 4-8-2s. However other classes sometimes helped out with maintaining the service and when motive power was in short supply Sydenham shed would turn out what was available. Many of these locos were allocated to a single crew and kept in sparkling external condition. Like many suburban rail services, frequent stops meant there was a need for quick acceleration to keep journey times to a minimum. This led to some remarkable performances by ageing steam locos operating a tightly timed schedule. Waiting at Uitenhage station one evening for a train to Port Elizabeth, a GMAM trundled through on a heavy freight from Port Elizabeth to Klipplaat and was perhaps continuing either west towards Mossel Baai or turning north to Graaf Reinet and Rosmead. A few minutes later a class 24 2-8-4 clanked to a stand in one of the station loops. A whistle in the dark heralded 15AR class 4-8-2 no.1858 running tender first with a 10 coach train. Some of the coaches were branded "white only" whilst others were reserved for "blacks only" such was the politics of the day. Photo - A South African Railways 15AR class 4-8-2 heads a Uitenhage train towards Port Elizabeth. This was the last steam operated suburban service in South Africa. Doors opened and the contents of the train spilled onto the platform as people headed home from work. The loco was quickly uncoupled, watered and was soon at the head of the train ready for a prompt start back to PE (as Port Elizabeth was always called). I wandered up the platform to look at the loco. The crew were leaning from the cab and quickly engaged in conversation. I remember complementing them on the cleanliness of the loco and they just smiled and nodded. All the brass and copper fittings were polished and shining. The smokebox had been treated with graphite providing a silvery sheen under the fluorescent lights of the station. The only thing missing was a clean tender! Departure was on time and we headed off into the darkness. The exhaust was sharp and noisy. The fitters has done a good job back at Sydenham shed as the engine ran like a dream, well balanced and not a steam leak in sight. Acceleration was superb and once line speed had been reached the train coasted to a stand at the first stop at De Mist. A similar sharp get-away and off like a rocket to make further stops at Despatch, Perseverance, Redhouse and Swartkops where we joined the main line from East London. New Brighton and Sydenham (within sight of the busy shed) were the final points of call before an on-time arrival at Port Elizabeth. Throughout the journey the loco had been worked hard and fast but never thrashed. These crews were professionals and proud to do their job. This was steam passenger operation at its best. Getting off the train brought back many memories of years before. At the buffer stops a gleaming engine quietly hissed with whispers of steam evaporating in the night air. There was the same smell of warm steel, oil and coal that I remembered as a child at London Paddington. The driver and fireman had another chat before they uncoupled and ran round the train for their final trip of the day. What memories the short journey had evoked.